REALLY stay on the path! The remote settlement of Imber dates from at least Saxon times but is now an uninhabited “ghost village” within the MoD’s training grounds on Salisbury Plain. Traditionally reliant on agriculture, the townsfolk were evicted in December 1943 by the British Army to provide an expanded exercise area for American troops to train for battle during the Second World War. After VE Day, villagers were not allowed to return to their homes (although several attempts were made) even though they had been assured they would be able to return once the war was over. A public inquiry was held, and found in favour of Imber’s continued military use. Today access by the general public is allowed only on specific open days, usually around the religious calendar events, such as Easter, Christmas and St Giles’ Day (1 September) for parishioners to attend services in St Giles’ Church which still stands, fenced off from the surrounding training area, and dates from the 13th century. What is there to see in Imber? A visit to Imber is a rare chance to learn about the history of the village and to experience the peace of Salisbury Plain –a glimpse of an older, quieter time. 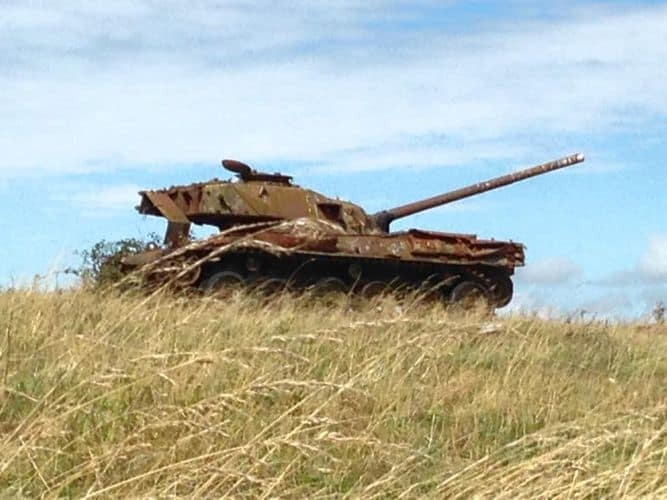 Driving in from Warminster, you pass burnt-out tank wrecks enroute which makes it quite a unique day out! Many of the village’s original buildings were demolished during the war, but several have survived, albeit with shell and explosion damage, and have also been eroded by weather which adds to the haunting atmosphere of the village. A focal point of any visit is St Giles Church. You may be lucky enough to be able to attend a rare church service (a couple of years ago, the Raven was there as the Bishop of Ramsbury officiated at evensong) or just appreciate the medieval wall paintings (which offer a rare depiction of the Seven Deadly Sins) and a set of 17th-century bell ringing changes painted on the north wall of the tower. There is a poignant exhibition of the life of the village and its inhabitants prior to its evacuation. Outside St Giles Church the sloping churchyard contains fine 17th-and 18th-century tomb chests. It is also possible to explore (carefully!) the old farmhouse, pub and Baptist cemetery. On the site of most of the village, modern “houses” looking like oversized Lego models have been built for urban warfare training. Bumpy roads – your suspension won’t thank you for faster than walking pace! Using the portaloo toilets at the end of the busy open day – they get fairly rank! There is an ‘Easter Egg Hunt’ this year that starts at 1200hrs (12 noon) for children under 12 years or you could join in a fun quiz about Imber and its church. Take a picnic and plenty of water – there may also be refreshments on sale in St Giles, and you can buy postcards etc so bring some change. Hows your map reading skills? Imber does not have a Satnav postcode. The OS grid reference is ST965 485. Imber is situated in an isolated area of Sailsbury Plain, about 2 1⁄2 miles (4 km) west of the A360 road between Tilshead and West Lavington. It is easy to miss the turning from the A360. Coming from Salisbury and three miles from Tilshead take the left turn just after the sign displaying West Lavington ahead and the Ridgeway to the right. Coming from Devizes and one and three quarter miles from West Lavington take the right turn just after the sign displaying Tilshead ahead and the Ridgeway to the left. Having made the turn keep straight on, passing a group of white houses on the left. Imber village is three and a half miles from the main road. If coming from Warminster take the Imber Road, passing the garrison church of St Giles and the Land Warfare Centre on the left. Keep straight on for approximately six miles until you reach Imber village.